Sept. 11 Epicenters N.Y., D.C. Celebrate Osama's Death Into Wee Hours : The Two-Way The announcement that Osama bin Laden was killed by U.S. forces sparked large celebrations in New York and Washington, the epicenters of the Sept. 11 attacks. 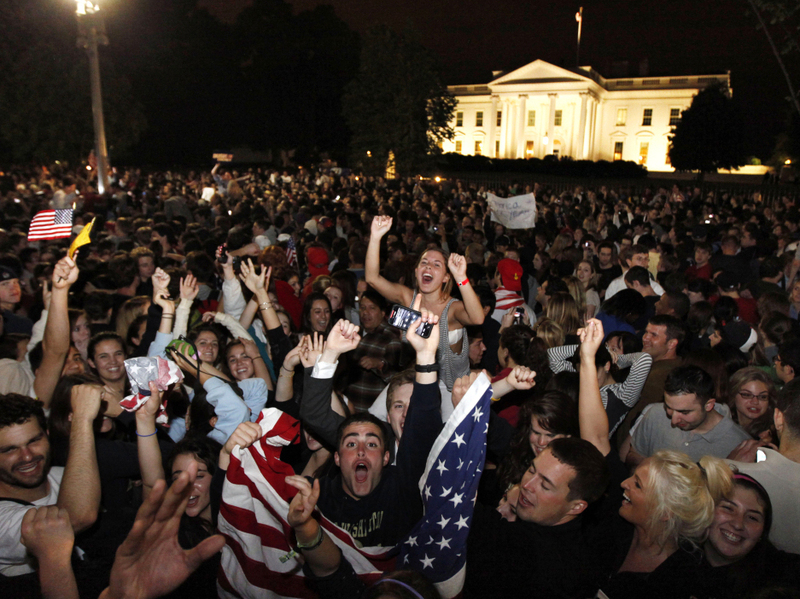 Crowds gathers outside the White House early Monday, May 2, 2011, to celebrate President Obama's announcement that U.S. troops killed Osama bin Laden. They came, first by the scores, then by the hundreds, to the streets outside the White House in Washington, near Ground Zero and in Times Square in New York City to celebrate the death of the world's most wanted man, Osama bin Laden, at the hands of U.S. forces. In both cities that formed the twin epicenters of Sept. 11 attacks, spontaneous chants of "USA, USA. USA" were heard from people who came out to share the moment that Americans had waited ten years for and that many thought they might not ever see. They came to soak in what many sensed to be a signal moment in American history. They waved American flags on one of the most jubilant nights in memory. In scenes reminiscent of the World War II victory celebrations — VE Day and VJ Day — people embraced each other and pranced in public displays of joy. Soon after the first news reports that the U.S. military had killed the al Qaida mastermind who claimed credit for the Sept. 11 deaths of nearly 3,000 individuals, a crowd that formed at the White House began singing the Star Spangled Banner. Later in the evening, CNN reported that people outside the White House fence were chanting "Yes We Can," which had a double meaning Sunday evening. It was not just affirmation that the U.S. had finally gotten its man but it was, of course, President Obama's 2008 campaign slogan. People interviewed by news reporters at Ground Zero were asked what the news meant to them. Some called his killing a vindication and justice. Some called it closure. Stephanie Zessos, who lives in the neighborhood and works for the fire department, said sadness also was mixed in with the celebration. "I texted a friend of mine who's a firefighter who lost a brother on 9/11, and he said the pain will never go away," she said. when he heard of bin Laden's death. world. To have this cancer pulled from us is the right thing,"
Madsen said. "This is Judgment Day and we're winning..."
... Will Ditto, 25, a legislative aide, said he was getting ready to go to bed Sunday night when his mom called him with the news. He decided to leave his home on Capitol Hill and join the crowd. As he rode the subway to the White House, he told fellow passengers the news. "It's huge," he said. "It's a great day to be an American." The evening at times had the feel of proud sports fans celebrating their team's championship. Indeed, at one point, the crowd outside the White House started singing the song heard at many a ballpark: "Na Na Hey Hey Kiss Him Goodbye." Outside the White House on Pennsylvania Ave. people climbed trees and urged on the crowd below. At Ground Zero in New York, two people scaled a lamppost one waving a flag, the other spraying the crowd with the contents of a champagne bottle. But even as Americans celebrated, there was the lurking awareness that not everyone in the world was celebrating. Indeed, in coming days, it wouldn't be surprising if the next scenes of street demonstrations would not be of impromptu celebrations but protests by those who viewed bin Laden in heroic terms. But on Sunday evening into Monday morning, it was those who celebrated the demise of the al Qaida leader who were having their say.